For the second week United made a trip to Lincoln, this time to play Hykeham Town. This was a quick return fixture with Hykeham winning at Skegness in the open day fixture. Once again United had to make changes due to availability and this gave George Hobbins the opportunity to come into the side for his first start. Hykeham started the match at a fast pace and after around seven minutes took the lead when from a corner Mike Sullivan rose above the United defence to head home. United’s first positive action of the match came on 12 minutes when a move between Hobbins, Troy Lonslow, and Arron found Harry Ginniff, however his final pass was too long for Daniel Reid to reach. On 15 minutes Hykeham went two up from the penalty spot. From another corner, the referee deemed that Alex Tittcomb had pushed a Hykeham player in the area. There was no appeal for a penalty from Hykeham and the visitors were amazed at the decision. From the resulting spot kick Chris Funnell sent Travis Portas the wrong way with his kick. The game for the first 20 minutes had more or less been all Hykeham, however from this point United began to come more into the game, with Troy Lonslow causing Hykeham problems with runs down the right. The visitors needed to be solid for the first 15 minutes of the second half to enable them to get back into the game, but with 10 minutes gone they fell three behind. A cross ball from the right went across the goal and Robin Newman, unmarked at the far post, knocked the ball home. On 60 minutes, United got themselves back in the game and again it was a goal from a corner, with man-of-the-match Lonslow rising above the Hykeham defence to head high into the net over the keeper. United had their best spell of the game, finding space on both flacks through Reid and Lonslow, however they lacked the final touch in front of goal. Hykeham scored their fourth in the final minute. United had the ball close to the touch line when the assistant flagged for a throw in. United failed to organise and Sullivan went on to score his second of the match. Overall it was a much better performance from United against the opening day match against Hykeham. But the home side deserved their victory and it will need to be a good side to take the title away from them. Skegness: T. Portas, J. Portas, Howitt, Tittcomb, Cunliffe, Clarke, Scutt, Hobbins, Ginniff, Reid (Harris), Troy Lonslow. Man of Match: Troy Lonslow. United are on their travels again on Saturday when they visit CGB Humbertherm, with a 3pm kick off. l United’s Development Side started their league programme with an away fixture at North Thoresby. Clever play between Pickett, Wolstenholme, and Charles early on caused problems for the Thoresby defence. Pickett was particularly lively in the final third and opened the scoring with an excellent shot which left the keeper no chance. From this point, United dominated the game. Marcus Leatherland doubled United’s lead with a bullet header direct from the corner. Against the run of play, North Thoresby got themselves into the game. A slip at the back left a loose ball and the Thoresby forward took advantage. United responded soon after with Jamie Wolstenholme scoring the first of his three goals. For the remainder of the game, it was United who pressed with the Thoresby crossbar being rattled on three separate occasions and shots flying over the bar numerous times. The introduction of Josh Nwokobia brought more misery for Thoresby. Despite another opportunist goal for Thoresby, United pushed on and further goals came from Nwokobia and Jamie Wolstenholme who completed his hat trick to round the score off at 6-2. 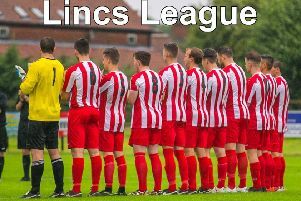 Skegness United DS are at Wainfleet Road on Saturday to welcome Louth Old Boys Vets, 2.30pm kick off.